How far along? 32 weeks yesterday! I'm thrilled to have met this milestone which means I can now deliver at my preferred hospital. Weight gain: I could not believe the scale this morning: 183lbs! That means I gained FIVE POUNDS last week. How is that even possible?? Oof. I do feel very swollen (but not alarmingly so in a pre-eclampsia way, don't worry), so many some is fluid retention? In any case I'm now up 44lbs total. How are you feeling? I'm still extremely grateful that this pregnancy is going so well! I am super uncomfortable now that my belly is measuring 40 weeks, however all my aches and pains are all very normal pregnancy stuff for which I am grateful. My belly is just huge. You guys have seen pictures of me and you know I'm a super pale skinned person: almost glow-in-the dark. Well one of the most surprising things about this pregnancy is that I haven't gotten any stretch marks yet! I am shocked. I'm one thousand percent sure I'll get them yet- I mean, how can I not when I'll be stretched beyond nature- but it has been quite the surprise that I've avoided them thus far! Noteworthy moments: I had a great ultrasound and appointment on Friday! Baby A is head down (yay!) and measuring 3lbs10oz. His "big" brother is 4lbs6oz! Even though Baby B has flipped to a head-up position, my OB still supports me attempting a vaginal delivery as long as Baby A stays head down. Both she and the sonographer seemed to think it was likely Baby A would stay that way, which makes me happy! The most fun part of the ultrasound was when John and I got to see that both babies have a head full of hair! I have been picturing them as two little bald babies so that was just really cool to see. It made me so much more excited to meet them! Get a little spiritual: I remember at the beginning of my pregnancy I wondered how I would feel toward the end, emotionally speaking. While John and I have not closed the door to a future pregnancy, at this point I do not want to undergo anymore fertility treatments and I am treating this like the one and only time I will be pregnant. I was a bit worried that I would be quite sad at the end of my pregnancy. I am not sad at all. I absolutely want these babies to stay inside until they are term, but physically my body is just about done. I have loved and cherished this amazing experience feeling life grow inside. It has been everything I dreamed of and I don't mean that in a cliché way. I wanted to experience pregnancy and I did- from the joy of finding out I was expecting, to seeing my babies on the ultrasound screen, to morning sickness, to the food cravings, to the first fluttery movements, to the alien like punches and rolls inside my belly... I wanted to know what all of it felt like and now I do. I feel so happy, so full, so complete. I feel like I can move forward with my life, fully satisfied with this experience. Now I'm ready to be done. These next 6ish weeks are going to be hard, physically, but I have been thinking that it is good they will be hard because it will make me (has already made me!) ready to say goodbye to this pregnancy and move forward to parenting these two little babies. I pray God will give me the strength and endurance I need to finish this season well and I thank him even for the tough parts which make me ready and happy to move forward. Bump shot: John took this picture on Easter Sunday while Arie was hunting for eggs. A few people have told me that the pictures I post don't capture the size of my belly: hopefully this one does! Ive been following your blog for a bit. I have identical twin boys (now almost 8 years old!). My baby A was the smaller one and was head down, Baby B ended up 8oz heavier than his brother and was head up! I did deliver vaginally so it is possible! Good luck and you look amazing! Love hearing your success story! Did baby B flip or come out breech? That is a big ball on a thin woman! You look AWESOME! So glad your babies are doing so well! Ha! That made me smile. Thank you Michelle! I am not sure how I stumbled upon your blog but I have been following for a few weeks now. 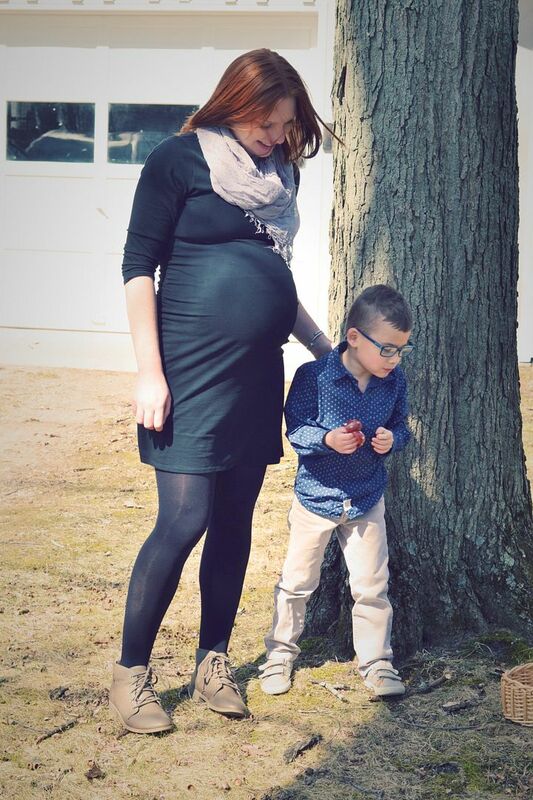 I have 2 year old twin boys and your posts bring me back :) My boys were 5lb11oz and 6lb11oz and my belly measured 46 weeks at 38 weeks when they had to induce me. I was lucky enough to be able to work from home the last 2 months and weeks 35-38 I did not get off the couch except to go to dr. appointments. Hang in there! It's (obviously) totally worth it! You are a ROCK STAR!!! And your belly is simply adorable. :-D Made me happy to read that! Thank you!! I've been following your blog for awhile - love it!! And I now love it even more, just found out we are expecting twins this Fall. Our #3 and #4. Looking forward to reading back as I go through each week. Thanks for being so open and honest during your pregnancy!